(Newser) – Paul Ryan unveiled a Republican budget plan today that would slash $5.1 trillion in federal spending over the coming decade and balance the government's books with wide-ranging cuts in programs like food stamps and government-paid health care for the poor and working class. About 40% of Ryan's projected savings would come from the repeal of ObamaCare, reports the Wall Street Journal. Ryan's budget claims balance by 2024, but relies on $74 billion in savings in that year from the macroeconomic effects of cutting deficits, which CBO says would have a long-term positive effect because it would free up savings and investment capital. Democrats are sure to seize on the maneuver as phony math; without these projections, however, Ryan's budget plan would fall almost $70 billion short of balance. Next on Newser: Yelp's Ad Practices: Extortion? 10 years? Cut the military that's how we got a balenced budget and surplus in 1996. The pentagon has spent 4 trillion on a plane that doesn't work. I'm sure there are plenty of other programs just like that. I believe in a balanced budget, but not doing it on the backs of the poor. There should be a balanced budget amendment in the Constitution now...not in 10 years. We need to stop starting wars and take care of our own. Unless our national security is threatened we should mind our own business. 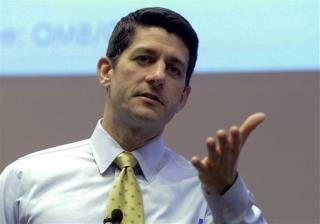 Ryan has had only one job in the federal goverment, and he is worth over 3 million dollars and owes nothing. Question is are we paying him too much or is he getting kickbacks from the milatary contractors. I think he is a clone of George Ryan ex governor of Illinois and ex con.